The Hirshhorn Museum and Sculpture Garden is the national museum of modern and contemporary art and one of the world’s leading voices for 21st-century art and culture. Located on the National Mall in Washington, D.C., the Hirshhorn is one of 19 Smithsonian museums. 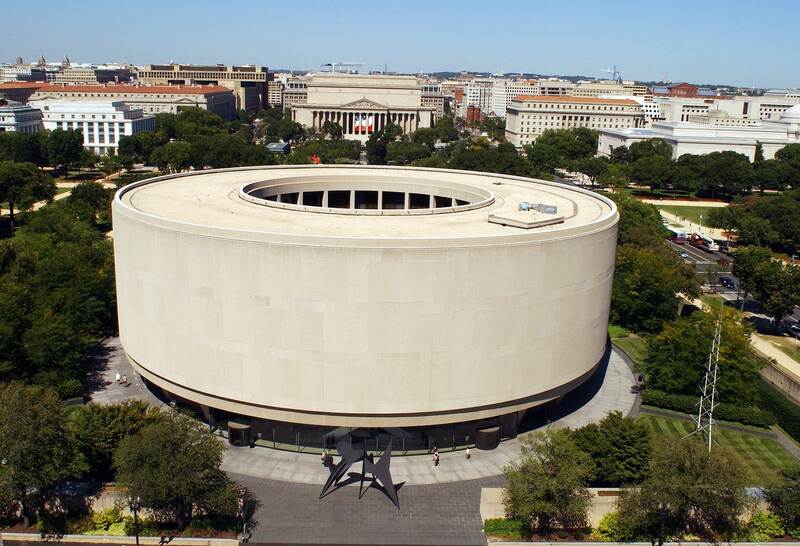 The museum opened Oct. 1, 1974, as a result of the efforts and generosity of American entrepreneur and philanthropist Joseph H. Hirshhorn (1899–1981), who donated his collection to the Smithsonian in 1966. Known for its striking Gordon Bunshaft-designed architecture, the museum has 60,000 square feet of exhibition space inside its elevated circular building and nearly 4 acres outside in its multilevel Sculpture Garden and Plaza. The permanent collection of roughly 12,000 artworks includes pieces by leading artists from the late 19th century to the present day and comprises paintings, sculptures, photographs, mixed‑media installations, works on paper and new media works. The Hirshhorn has one of the most comprehensive collections of modern sculpture in the world, with many examples on view indoors and in the Sculpture Garden. In-depth holdings include works by Josef Albers, Francis Bacon, John Baldessari, Alexander Calder, Joseph Cornell, Willem de Kooning, Jean Dubuffet, Thomas Eakins, Alberto Giacometti, Barbara Hepworth, Ellsworth Kelly, Morris Louis, Henry Moore, Louise Nevelson, Isamu Noguchi, Salvatore Scarpitta, David Smith, Clyfford Still and Hiroshi Sugimoto. An active acquisitions program continually adds work to the collection in all media, with an emphasis on new work and the work of artists exhibiting at and collaborating with the museum. Artists such as Ai Weiwei, Doug Aitken, Mark Bradford, Nick Cave, Carlos Cruz-Diez, Douglas Gordon, David Hammons, Mona Hatoum, Robert Irwin, Claes Oldenburg, Yoko Ono, Raphael Montañez Ortiz, Susan Philipsz, Adrian Piper, Gerhard Richter, Doris Salcedo and Rachel Whiteread are represented by major works. Global modernism is also a collecting focus, and recent additions include works by Chung Sang-Hwa, Monir Shahroudy Farmanfarmaian, Natsuyuki Nakanishi and Park Seobo. African-American artists recently entering the collection include Charles Gaines, Jennie C. Jones and Senga Nengudi. The Hirshhorn is also committed to presenting new works from emerging and established artists. Recent exhibitions have featured Jeremy Deller, Jennie C. Jones, Grazia Toderi, Cyprien Gaillard and Mario Garcia Torres, and Pipilotti Rist. The Hirshhorn’s commitment to moving-image artworks can be seen in exhibitions by artists such as Ragnar Kjartansson, Oliver Laric, Santiago Sierra and Jorge Galindo, DEMOCRACIA, Ali Kazma, Nira Pereg, Hans Op de Beeck and SUPERFLEX. The Hirshhorn’s diverse range of year-round, free public programs invite today’s leading innovators in art, design, music and technology to explore ideas that shape 21st-century culture. Recent guests include 2017 Venice Biennale curator Katy Siegel, Creative Time chief Curator Nato Thompson, The National guitarist and composer Bryce Dessner, celebrated architect David Adjaye, The New York Times art critic Holland Cotter, and digital scientists from MIT and Stanford University. The museum’s signature Artist Talk series features internationally renowned artists for intimate public discussions, including Mark Bradford, Shirin Neshat, Jason Moran and Theaster Gates, Jake Chapman, Ann Hamilton, Christo, Barbara Kruger and Vito Acconci. Its annual James T. Demetrion Lecture has featured speakers such as Ai Weiwei, Anish Kapoor, Claes Oldenburg, Jeff Koons, Doug Aitken, Marina Abramović and Simon Schama. The museum is open daily (except Dec. 25) from 10 a.m. to 5:30 p.m. The Plaza and Sculpture Garden open at 7:30 a.m., with the Plaza closing at 5:30 p.m. and the Sculpture Garden closing at dusk. The Hirshhorn is located along the south side of the National Mall, at Independence Avenue and Seventh Street S.W. The museum entrance is on Independence Avenue and the Sculpture Garden may be accessed from the Mall and Jefferson Drive. The nearest Metrorail stop is L’Enfant Plaza on the Green, Yellow, Blue and Orange lines (Maryland Avenue exit).